1. Mix the porridge oats with the milk and leave for 2 hours. 2. Mix the flour, baking powder and salt together. 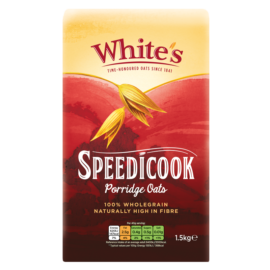 Mix this with the soaked porridge oats, rubbing until it is crumbly. 3. Stir in the mashed bananas, sugar and cinnamon. Knead until doughy. 4. Press the dough out to one inch thick, cut into eight and sprinkle with White’s pinhead oats. 5. Place on a floured baking sheet. Bake at 200°C / 400°F/ gas mark 6 for 30 minutes.